I can typically create a film summary in just a sentence. On other occasions, I come up against a movie like The Double that just tickles my brain with its many, many (obvious) sources of inspiration and it leaves me scrambling to wrap up the details into just one tasty morsel. 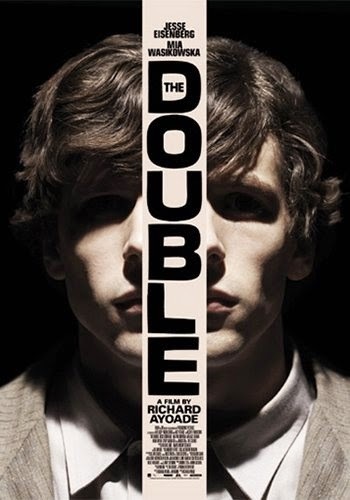 Double is best described as "compellingly weird". It has the visual quality of a music video or like something Spike Jonze directed in the early 90's (Being John Malkovich or Adaptation). Smoosh that together with the surrealist dystopian masterpiece, Brazil. Sprinkle on top the nagging feeling that Alex Proyas could have made it in between The Crow and Dark City. Mix the whole thing up and it feels like the perfect marriage of Jim Jarmusch and Wes Anderson. Whew. The story is reminiscent of Metropolis, and carries with it a similar soul crushing feeling about industrialization and the mechanization of humanity. There is an excess of subtext around feeling like you don't exist. Double also has a bit of the emotional tone of Mary and Max; primarily sad, yet somehow up-lifting or hopeful or just not all together depressing. On top of all of this is the undeniable specter of 1984, shrouding the entire story in this uber-controlled nightmare. If I didn't pause here to bring up the elephant in the room, I'd be a very, very poor movie blogger. Call me "ruined by Fight Club", but really? I can't watch a surrealist movie in which a shy man is suddenly befriended by a guy who is completely his opposite WITHOUT thinking they are actually THE SAME person. A thought that is challenged or complicated by the fact that the two men in question are played by the same actor. Twist this one any way you like, it is still the key to understanding this movie and will tell you how things are going to end. Overall enjoyable and absolutely sure to make those who get squirmy during awkward moments extremely uncomfortable.